This little dandy just took a few minutes and the effects are worth while! The cardstock is all Stampin up. The gold cord I got at a thrift store and the stamp is a Stampin up stamp (from 2006). 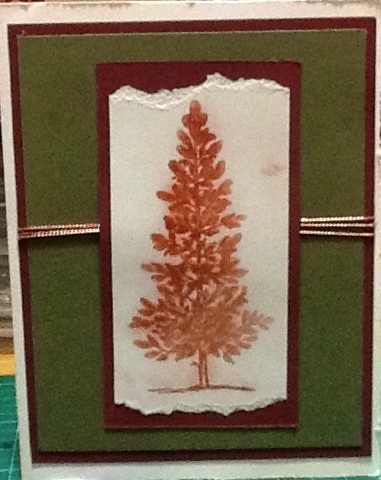 The tree was completed by stamping with versa mark and then taking the perfect pearls copper dust and their feather light brush and dusting over the top. When the versa mark dries it is like a glue for the copper powder and it sticks in place. I chose no sentiment on the inside or outside of the card because it could be used as a notecard close to or after the holidays. Hope you have had a scrap happy day.